This is a hidden gem more suited to wine-lovers than coffee gourmands, but I love the environment and surrounds. You are somewhere between a traditional Englishman’s Club and a Parisian cafe, with row on row of wines available behind the bar. There are selections of tapas and sandwiches, and a waitress service area for hot food. 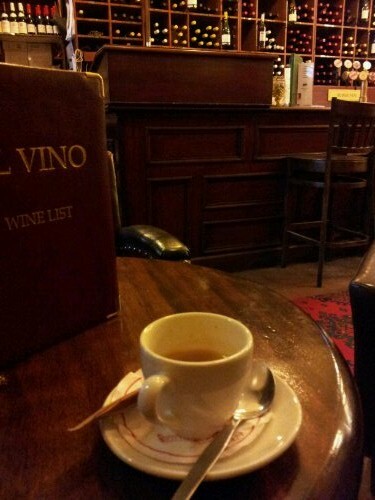 The coffee is bearable – quite “French” in style – but the atmosphere more than compensates. Others: great wines, beers and a selection of food available. Totally off the beaten track – you may be the only one in there.